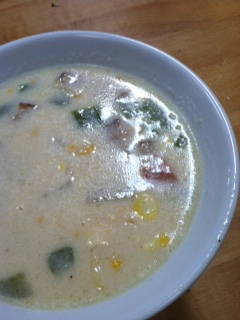 August has all the makings for a perfect corn chowder. 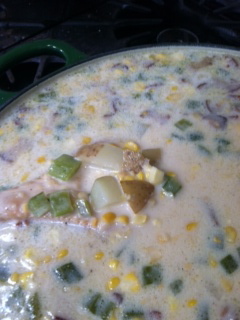 When you can cut corn fresh off the cob and new potatoes are in season the time is right for this dish. I use an old family recipe – not my family! I got it from a friend long ago and make it often. It can be made with canned corn, but when it’s in season, you MUST use fresh. 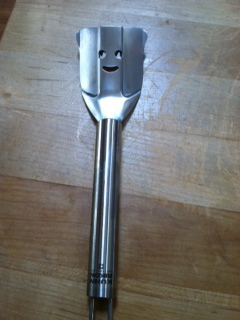 I use one of these handy corn strippers to remove the kernels. I always make at least a double batch – if I’m going to the trouble I’m going to make enough to enjoy for a while myself and have enough left over to give away. The recipe is for a single batch if you’re not so inclined. 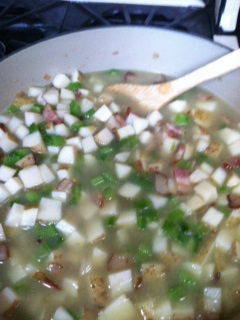 Saute bacon and onion in a large stockpot. When bacon is almost crisp, add celery. When bacon is crisp, add potatoes and boiling water. Cook until potato is soft and water thickens a bit. Add remaining ingredients and heat to boiling. Tastes even better the next day.